The much-awaited teaser for young hero Vijay Deverakonda and Kannada starlet Rashmika Mandanna’s upcoming romantic entertainer, Geetha Govindam, was unveiled today and it leaves a striking impression thanks to Vijay-Rashmika’s quirky and yet sizzling chemistry. 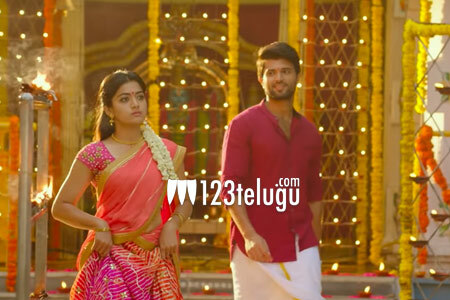 Geetha Govindam’s teaser showcases the uneven relationship of Geetha (Rashmika) and Govindam (Vijay). How the 25-year-old virgin Govindam wins a tough taskmaster Geetha’s love forms the crux of the story. Geetha Govindam’s audio album will be out on July 29. The film will be opening in cinemas on August 15. Parasuram has directed the movie and Bunny Vas has produced it. Malayalam music composer Gopi Sunder has scored the film’s music. Allu Aravind is the presenter for the movie.